I recently had the opportunity of reviewing a great SLS Free organic baby shampoo and body wash from a company recently introduced to me: GlowGenics. For the sake of transparency it should be noted that GlowGenics initially reached out to me and sent a sample product asking for an opinion. While I have reviewed a number of SLS Free products in the past, our regular readers will be aware that I have never ‘featured’ a product on the site before now. In this case I was so impressed after trialling the product that I reached out to GlowGenics asking if they would be open to allowing us to feature the product on our site. What is Organic Baby’s Glow? 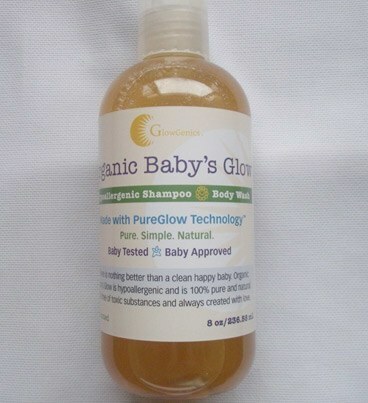 GlowGenics Organic Baby’s Glow is a dual purpose baby shampoo and body wash, created with completely natural ingredients, certified organic and cruelty free (not tested on animals). Essentially the product can be applied from head to toe and is suitable for all ages. Glowgenics is a husband and wife team based in the USA (the product is also manufactured in the USA) who share a passion for organic products. They were savvy enough to realize that a great deal of supposedly “natural” products are actively marketed in a misleading way, and so they created their own truly organic product that they could use for their family. I tested GlowGenics on my own three young children and asked another two people who had experience with children’s shampoo to also test the product. My experience with the product was very positive. As noted above, the product did produce a great deal more lather than any organic shampoo I have used previously and my children’s hair was clean (much cleaner than normal), fresh and tangle free when brushing. While there were mixed feelings on the initial smell – my children either loved it or thought it smelt funny (not unpleasant, just different) – all agreed that their hair had never felt better after using an organic product. Not surprisingly we had similar feedback from the additional parties that were asked to review the product, with the general consensus being that this was indeed the best organic shampoo / body wash product they had used to date. I also took a look over some reviews posted online and wasn’t surprised to see very positive feedback from customers who had previously bought the product.